"Great news, guys. We've got the green light!" Darlene came rushing through the door. "We can have the hotdog stand at the Missions Fair." "Hotdogs!" Jeremy exclaimed. "Yummy! I am hungry already." "Who is volunteering to help?" Darlene continued. "There are going to be lots of other stalls with tidbits and the only way we are going to be the talk of the town and sell all our hotdogs, is going to be by our tasty sauces." "I'll help with the tasting," replied Art, smacking his lips. "I like chilly sauce." "I like it extra hot," Ben said bragging a bit. Tom disagreed. "Mine must be mild but spicy." "I like tomato and onions," Steve said, his mouth already watering. Eddy giggled. "Mustard for me please!" Darlene laughed. "You guys can't just think of eating; you must first help us put up the stand. We are going to need a banner too, so that everybody will know where to find the most delicious, tasty hotdog treats at the fair! Afterwards, you might just be rewarded with your favorite hotdog super special, totally free." "Then we are definitely in," the boys agreed eagerly. "I'll help frying the sausages!" Ann said. "And I'll help cutting the buns," Mary cut in. "I'll help cooking the sauces before the time and serving them during the fair," Joan said. "I'll do the selling," Rupert offered. "Oh, thank you, all of you. You will be such a great help!" On the day of the Missions Fair, everybody chipped in. The boys helped by putting up the stand with its burners and they also put up the banner. It read, "Tastiest Hotdogs Ever!" The girls helped by making the hotdogs and Rupert and Darlene did the selling. At the end of the day, they made quite a large sum to give to missions and only a few hotdogs were left over, just enough for everyone who helped. "I won't take mine for free," Ben suddenly said. "I would rather pay for it and give the money towards the Lord's work." "That is a wonderful gesture, Ben!" Darlene said and all of them immediately agreed to do the same. 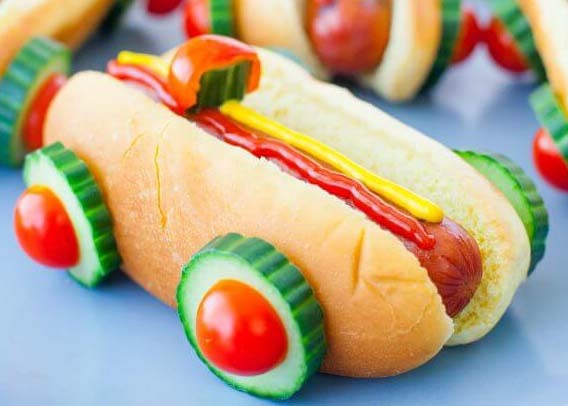 While the others were munching on their delicious hotdogs, Steve and his hotdog disappeared towards the leafy avenue. There, out of sight, he gave his tomato and onion hotdog to a homeless man and returned to his friends. "Come on, guys. Let's sing a song to the honor of the Lord, to conclude this wonderful day!" He is the way to Heaven." While the Israelites were camping at Rephidim, enjoying the cool, refreshing water streaming from the rock, something evil was brewing. It was something they did not think about since crossing the Red Sea because they were too busy complaining about lack of food and water. Lurking behind the hills were the fierce Amalekites, whose prying eyes were spying on them from a distance, noticing that they had found an abundance of water. 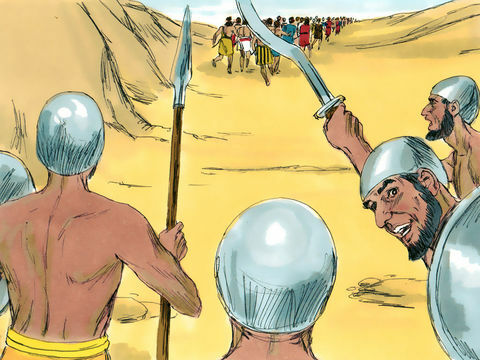 The Amalekites were vicious nomads, a tribe constantly moving around in the desert, looking for water, killing people for pleasure without even blinking an eye. Actually, they were distant relatives of the Israelites, because they were descendants of Esau, the brother of their forefather, Jacob. Unfortunately, the Amalekites did not care one bit about this or any other relation, because they made a living by attacking and raiding other tribes and taking their possessions as booty. Besides having their eyes on the abundant water supply, they figured out the Israelites possessed costly and precious ornaments of silver and gold taken from the Egyptians. There was no way the Amalekites were going to let this wealth of an opportunity pass them by, so they cunningly planned an attack, discussing how they would kill the Israelites and take all their possessions. The Amalekites didn't really know Who they were up against because, all the while, the Lord was watching over his beloved Israelites. He alerted Moses about this planned attack. Moses quickly called Joshua and commanded, "Joshua! Get your army ready to fight against the Amalekites first thing tomorrow morning. I'll climb up the hill with the rod of the Lord, praying and watching from above." Early the next morning, while Joshua and his army set out towards the advancing Amalekites, not one, but three determined figures gradually made it up to the nearby hilltop. Moses had the rod of the Lord in his hand while Aaron and Hur, who had insisted that he should not go alone, accompanied him. Out of breath, the 80-year-old Moses and his companions reached the top of the hill while down in the valley below, the fight began. The clashing of swords, spears and sticks, as well as loud shouting, could be heard from the top of hill as the frightening noises cut sharply through the cool morning air. Looking down the hill, Aaron and Hur gasped. "OH, NO!" Joshua and his men were retreating, losing ground! That was quite understandable because Joshua and his men didn't know much about war since they were not trained soldiers. All they knew was how to be slaves in Egypt. Besides, last time around, when they were in danger of an attack, the Lord drowned their enemies in the Red Sea without their even having to lift a finger to fight. What would happen now? How would they ever win? Moses knew just what to do. He lifted up the rod in his hands, prayerfully to the Lord. Miraculously, Joshua and his men began gaining ground again. As long as Moses' arms were in the air, the Israelites were winning. After a while, the muscles in Moses' arms began to ache, forcing him to lower his arms to rest. He was not used to keeping his arms in the air for such a long time. Just as his arms went down, Joshua and his men began losing ground again. Moses realized his arms had to go up again so, after a short rest, he forced his arms into the air because it was more painful to see the Israelites loose than it was to endure the pain in his arms. As soon as Moses' arms were up, Joshua and his men began winning again. 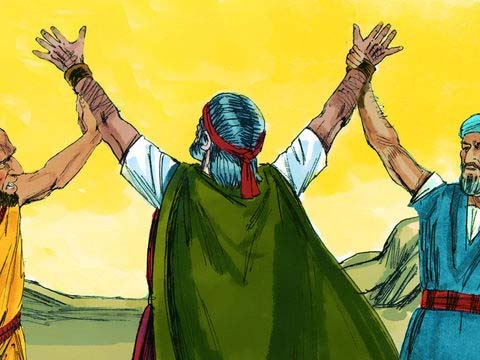 Aaron and Hur saw Moses was struggling to keep his arms up and they knew he could not hold them high for much longer. They also realized that Joshua and his men would lose if Moses lowered the rod of the Lord for too long, and they could not bear to think what would happen then. Determined to do something about it, they quickly made a plan. They found a nearby stone, rolled it closer so that Moses could sit on it with ease. Then they stood next to him, one on the left side and the other on the right side, each helping Moses by holding up one of his arms. Moses was so relieved and glad that the Lord had led Aaron and Hur to come with him and help him. Without them, he could never have kept his arms up the whole time. As the three men watched the fight, they kept on praying. From the valley below, Joshua and his men glanced up towards the hill to where the three men were. They saw the arms of Moses with the rod of the Lord held high like a banner for everyone to see. To them, it was a sign of the Lord's presence, watching over them and protecting them. It greatly encouraged them and made them even more courageous, knowing that, because the Lord was with them, no weapon formed against them would prosper. 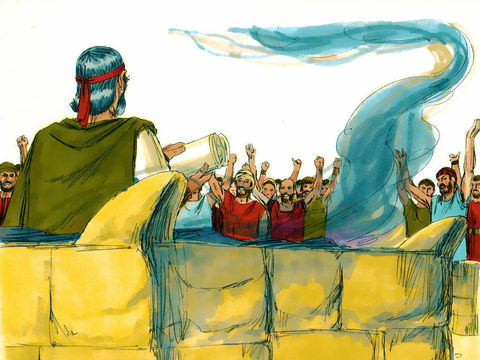 Wave after wave of enemy soldiers attacked, but the whole time Moses' arms with the rod of the Lord were held up in the air. Joshua and his men kept on gaining ground until they crushed the Amalekite armies with the Lord's help. By sunset, the remaining Amalekites fled, scrambling away like a herd of wild swine before a pack of roaring lions. The Lord gave Joshua and his men victory, because Aaron and Hur helped Moses to hold up his arms the whole time. It was the Lord's way of teaching them all to work together to get things done his way. Then the Lord spoke to Moses and told him to write the event in a book to constantly remind Joshua that He would completely destroy the Amalekites. He would annihilate them because they were not only making war against the Israelites, but also against the Lord, being such a vicious tribe, killing people and stealing their possessions. After their victory, Moses built an altar for the Lord, to thank Him for his protection and for victory over their enemies. He called the altar, Jehova-Nissi, which means, "the Lord is my banner." Today, Jesus should be our Banner, knowing that He gave his life on the cross so that we can have victory over sin. Soon Moses would receive even more help when his father in-law, Jethro, the priest of Midian, heard about the wonderful things the Lord did for Moses and the Israelites and came for a visit. He brought Moses' wife, Zipporah, and his two sons, Gershom and Eliezer, with him. Moses told him about all the miracles the Lord had performed for Israel, delivering them from Egypt, caring for and protecting them in the desert. Jethro was truly amazed and overjoyed at what the Lord had done for Moses and the Israelites. Through Moses' testimony, Jethro came to believe that the Lord really was greater than all other gods. With grateful hearts, they offered a sacrifice and worshiped Him together. 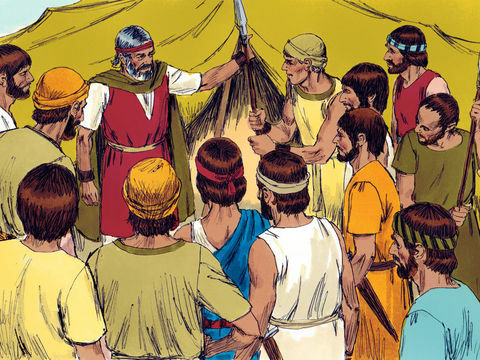 The next day, Moses was going about his business a usual as he sat down in his tent to judge the cases of the people. With all twelve tribes of Israel traveling together with all their belongings and all their animals, there was bound to be all sorts of trouble among them. 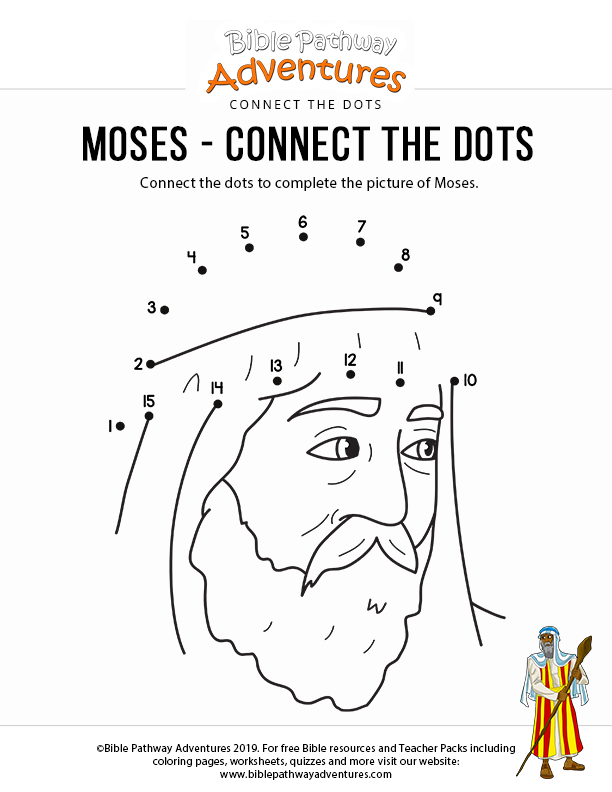 Moses was busy all day long sorting out the complaints and problems the people had with each other. At sunset, Moses was exhausted, and the still long line of people wanting his advice had to go home. It was just too much for Moses too handle. At dinner, a wise Jethro spoke to a tired Moses and said, "Moses, you can't go on like this. You are doing so much for the children of Israel, but you are going to deplete your energy completely and the people will get tired of waiting for you. They might start to fight among one another while they are waiting for you. This is what you must do: You must appoint wise men as judges to help you sort out the people and their problems. They can handle the easy cases, but if the problem is too difficult for them, they can ask you." Moses thought it was a very good idea so the following morning, wise, honest men who hated bribes were selected from each tribe. A judge was appointed for every 1,000 people and under them 10 judges were appointed, each for 100 people. Under them 2 judges were appointed, each for 50 people and under them, 5 judges were appointed, each for 10 people. These judges began working right away, tending to people's complaints and sorting out their problems. In this way, Moses got all the help he needed and peace and harmony were quickly restored in the camp. Soon after this, Jethro returned to his own land, leaving Moses' family with him, knowing that they were in the safe hands of The Living, Loving, Caring, Almighty God. God is greatly pleased when we help one another while keeping our eyes fixed on Him and his example. 1. Who led the Israelites in the fight against the Amalekites? 2. What happened when Moses let down his arms? 3. Who helped him to keep his arms in the air? 4. What did it mean for Joshua and his men when they saw Moses holding the rod of the Lord in his hands? 5. What does Jehova-Nissi? mean? 6. Who is our banner today? 7. Will you look to Jesus when you need help? 8. Can you think of ways you can help you parents, your siblings, your friends, your teachers, your pastor and other people needing help? "And let us consider one another to provoke unto love and to good works" (Hebrews 10:24). "Bear ye one another's burdens, and so fulfil the law of Christ" (Galatians 6:2). and helping us. Thank you also for people who help us. and enable us to do it.